As noted in the helical scrubber thread, I removed two of the LED panels from the scrubber and used them in a new upflow scrubber in the main tank. The current position of the scrubber is temporary. When I've used up the NitraZorb in the Topfin 75 filter (above and to the left in photo) I will remove it and reposition the algae scrubber on the end of the aquarium. It's a 16" wide 'narrow' tank, so the scrubber will fit with a couple inches of clearance on both sides. I'm running the lights about 16 hours. There's quite a bit of light leakage into the tank so I want to give the fish some darkness for several hours each day. Here's the scrubber screen after the first 7 days of operation. First photo is before removing the algae from the glass, second photo is the algae actually growing on the scrubber screen. It looks like I scrapped off some of the algae on the screen when I cleaned the glass. Anyways, I think it's a very good bright green, fluffy growth for the first few days. Here's the LED side. There is about 3/16" clearance between the backs of the LEDs and the frame so air can flow behind them for cooling. The LED panels are mounted on bolts and there's some up/down adjustment possible. Note: Photos 2, 3 and 4 have been rotated 90 degrees into landscape mode. The scrubber screen is 9" x 19" and I'm using a standard 8" trapezoid airstone powered by a single National Geographic adjustable power air pump set to it's highest flow rate. I bought the pump at Petsmart for CAD35 plus tax. The airstone and scrubber screen are mounted in a very light plastic tray designed to support plant seedlings. It attaches to the glass with 4 suction cups. I'm not sure how this is going to hold up once there's a significant weight of algae growing on it. Hopefully, the buoyancy in the water will help. The LED side hangs from the top with some additional support underneath so that it presses flush against the glass. On the theory algae doesn't grow as vigorously in freshwater as in saltwater, I decided to build a scrubber large enough to fit basically from the bottom of the tank to the water level and wide enough for a couple of LED panels. I would eventually like to use the scrubber(s) as the sole filtration (other than some sponges to remove floating debris) so I figured for freshwater bigger is better. If necessary, I can stick a second scrubber of similar size and design at the other end of the tank. In case you're wondering. Instead of building a frame to support the LED panels, I went to my local Sally Anne and bought a small sign frame that was the size I needed. Hence 'Powder Room'. I added a strip of styrofoam on the glass sides to provide airflow through the LEDs and help seal against the glass. Should work good. And FW does indeed grow as vigorously as SW. Better actually, and sooner, from what I've seen. Yes it will support itself, and it will not weight itself down when it fills up. 10 days in. I think this is pretty good growth for the first 10 days from a brand new, clean screen. There was also a lot of algae on the glass which I scrapped off with a hardware scraper. I just scraped it to the bottom of the tank. The fish and snails will eat some and the prefilter sponge/sock will catch the rest of it. I plan to clean the sponge and sock tonight. Yep should grow just fine. I cleaned the scrubber yesterday. 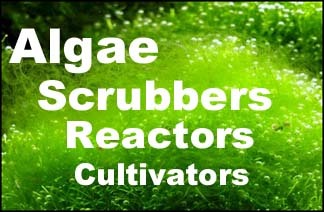 There was a huge amount of algae growth on the inside of the glass, much less on the actual scrubber screen. Unfortunately, I found it very difficult to get the algae off the glass without much of it drifting into the tank water and making a big mess. On the short term, I'm going to buy a 'cheese' slicer; the ones that look like a spatula with a slot in the middle. I'll attach a net to it somehow and hopefully when I scrape the algae off the glass most will go through the slot into the net. Long term, however... The glass is 5/8" and I think it's attenuating the light quite a bit, such that a significant amount doesn't get to the scrubber screen. Thus, most of the algae grows on the glass. I have some adjustment on the LED panels. Yesterday I added spacers to move the panels closer to the glass, but there's still about 1/4"-3/8" space between the panels and the glass. Does anyone think it would be useful just to go for it, and move the panels right out until they virtually touch the glass? Otherwise, I've got an idea for a mod to mount the LED panels inside the aquarium. It's not the brightness, it's just that the bubbles are rubbing the glass. If you back the screen away from the glass you will get less of it. Last edited by SantaMonica; 05-15-2016 at 02:37 PM. I decided to isolate the screen by adding a .080 clear acrylic cover. The plastic tray has small lips in each corner, so by cutting the acrylic square and then rounding the corners slightly, it fits in tightly enough to hold it in place. I'll post another photo when I remove it for cleaning again in a week or so. Most of the algae insists growing on the glass rather than the screen, so if that's where it wants to grow, then it can do so on the inside of the acrylic all it wants and I can get the scrubber out of the aquarium without spilling algae into the water. Hopefully! I also added some spacers under the LED panels to move them closer to the glass. So the lights are now about 1/16" from the glass. Maybe that will get more light to the screen. Finally, I have another mod I'm going to try on a new tray. Instead of using a removable screen, I'm going to put a layer of Bondo with embedded fiberglass strands. From past experience with this material I know it forms a fairly rough surface unless smoothed or sanded. Also if you concentrate the light into fewer but stronger LEDs... they will burn a hole through the glass growth. Cleaned the scrubber today. The acrylic cover worked well to contain the algae in the scrubber. There was, however, algae growing both on the glass and the outside of the acrylic! Fortunately, it stuck there fairly securely. I was able to get the scrubber out of the tank without much algae falling off the acrylic and I was able to scrape most of the algae on the glass into a big net. This was much better than before, much less algae floating around the tank. Still some and I managed to net most of it before it got sucked onto the pre filter sponge. The acrylic cover had bowed inwards during the week since the previous cleaning, thus creating a space between the acrylic and the glass. I thought this space might be the main reason algae decided to grow there. So I used my tape 'handles' to pull the acrylic straight and clamped the tape over the tray with plastic clothes pins. Maybe that will reduce the amount of algae growing on the glass and the outside of the acrylic. I also modified the scrubber support. The attached suction cups did not work well. So I drilled some 1/4" holes in a new tray for water flow and mounted the screen and acrylic cover. The tray rests on a fiberglass rod supported by two suction cups. The bottom edge of the tray slips between the rod and the glass which puts it tight against the glass. It is now very easy to lift it out and slide it back in again. Today at Walmart I bought a Sterilite Ultra Seal 16 cup / 3.8 liter clear plastic box ($10). I want to make a smaller UAS for the gourami tank using this box and two more LED panels from the helical scrubber, which I've taken offline. While out shopping this afternoon I discovered some clear plastic boxes ($2 ea) in a Japanese store (Yoko Yaya). They are less than half the depth of the Sterilite Ultra Seal, a little less height and a little more width if mounted side by side. Each box is 10" x 5 1/2". So with both boxes mounted side by side (10" x 11"), about the same total screen area, and less than half the tank space as the Sterilite Ultra Seal. If I orient the LED panels to illuminate the 11" way, then pretty all the light will get directly into the boxes. Each box has it's own lid, so my plan is to use both together and clean only one at a time at a few days intervals. The lids on these boxes actually fit around the sides of the the body of the box fully, so they should contain the algae 100%. I'll post photos as I build the scrubber.